Alex Mihajlovski was born in Macedonia, and has resided in Denmark since 1992. He began designing and constructing a marionette puppet in Spain 1986. The result is Barti, a marionette puppet with an extremely complex system of string control, which is constantly maintained and developed. With more than 40 very fine and mostly invisible strings, Alex enables Barti to move his body, face features, fingers, and express emotions in a unique way. The first performance with puppet Barti was in 1988. There were only 9 strings then. Every year since then, and new string is added and new movements controlled by the new strings are invented. Traveling mostly in Europe ever since, he discovered the vast world of puppetry, and the culture behind it. Sadly, since the 70’s, marionette shows are disappearing, which makes Alex Mihajlovski, one of the few remaining professional marionette performers in the varieties and at festivals around the world. Alex was accidentaly discovered by variety producer Stefan Schönfeld, and he played his first variety shows in 2003. He then created the variety version of his performance, and named the show as the “Alex Barti show”. The puzzling and intriguing comedy numbers created by Mr.Mihailovski in the Barti show, are based on a theatre-pantomime, where the story and comedy is expressed in movement, mime and music. 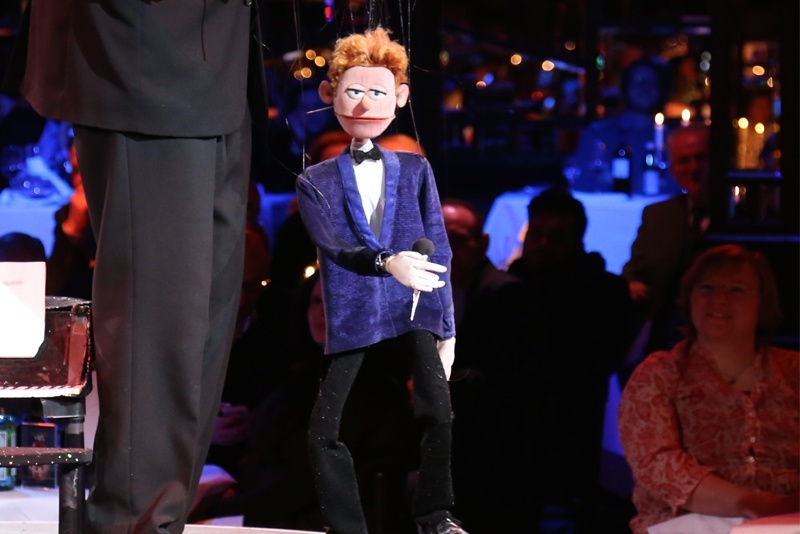 As a marionette show without any speech, Alex Barti Show is rare in the puppet world. For such virtuosity to be possible only by pulling strings, and controlling a marionette like Barti, the puppet-master has no time to think which string to pull. All manipulation is done instantly, transforming the expressive creativity of the master through the strings, into the marionette. For this to be possible, a new kind of marionette control mechanism has been invented and constructed by Mr.Mihajlovski. -2001 street performance festival. Oslo, Norway. The virtuosity of the puppet-master, Alex Mihajlovski – as a symbiosis between figure and snowman – enables the viewer to cross a border between reality and fiction. Barti the marionette, is almost alive!